Ribeye refers to the cut of beef that comes from the area of the ribs, as the name implies. 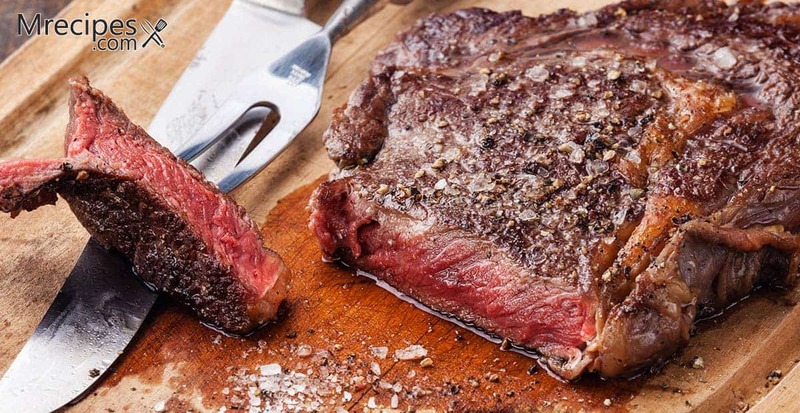 A ribeye is a steak portion that can be boneless or bone-in. These steaks are well marbled with fat and are immensely flavorful. The fat helps to keep the meat moist and juicy while cooking. A bone-in steak adds even more flavor to the meat. If you look up recipes for smoking ribeye steaks you may not find much. Or, you may find recipes that call for marinating the steaks in wine before smoking. Such a tender cut of beef lends itself quite well to searing and basting with butter in a cast iron skillet or grilling over an open flame for minutes. So, why would you smoke this tender cut of beef? Or, why would you marinate it? Smoking ribeye steaks does not compromise the flavor. In fact, it enhances it. You won’t get that charred exterior or grill marks that quick cooking over high heat will give you. But, you can always grill the smoked steaks over a fire or on a hot grill pan for just a couple of minutes after smoking to get the same effect. This is called reverse searing. Marinating the steaks is a matter of preference. Personally, I would never marinate such a beautiful cut of meat. I think it just adds the wrong kind of moisture. Seasoning the exterior of the steak will help seal in the moisture that comes from the marbled fat. In this article we will look at a quick and easy method for smoking ribeye steaks in a Masterbuilt Smoker and 2 different types of sauces to serve with the steak. Choose a sauce that also compliments your sides. Classic sides to serve with ribeye steaks are baked potatoes and creamed spinach. However, I think smoked potatoes are perfect. You can see my recipe for those here. Start the potatoes approximately 1 hour before you place the steaks in the smoker so that they are ready at about the same time. 1. Place the steaks on a clean cutting board and rub all over with EVOO. Season the steaks all over generously with salt, pepper, and any other dried seasonings you might be using. Remove a rack from the smoker and place the steaks on the rack to rest while you preheat the smoker. You want the steaks to be at room temperature. If the smoker is already on for potatoes, make sure you had removed a cold rack below the potatoes before you started the smoker. If not, just place the steaks directly on the rack inside the smoker. 2. Add wood chips to the tray of the smoker. Place water in the bowl. Preheat your smoker to a temperature of 220°F. 3. Place the rack with the seasoned steaks in inside the smoker. Smoke the steaks for 45 minutes. Check the temperature. You are looking for 125°F for medium rare and 145°F for medium well. Continue smoking if needed. Note: If you plan on reverse searing the steaks, take them out of the smoker at approximately 115°F and place them on a hot charcoal or gas grill, or on a smoking hot grill pan. Char each side for just a couple of minutes until the steaks come up to full temperature. 4. Remove the ribeyes from the smoker or grill to a cutting board. Tent with foil and allow to rest for 10 minutes. Serve individual steaks or slice and place on a platter. Serve with the sauce of your choice and sides. 1. Place the shallot and garlic in a food processor and pulse to mince. Add the herbs, lemon juice, pepper flakes, salt, and pepper. Turn on the food processor and add the EVOO in a stream through the top hole until all is well combined to resemble a runny pesto. 2. Serve the sauce at room temperature over the steak. You can store the sauce in the refrigerator for several days. 1. In a sauce pan, melt the butter over medium-high heat. Add the onion and sauté until wilted and golden brown, approximately 7 to 8 minutes. 2. Whisk in the heavy cream and Worcestershire sauce. Bring this to a soft boil, then stir in the blue cheese and allow it to melt. Season with salt and pepper. 3. Serve the warm sauce with the steaks.